The Consortium has published this standardized notation, ProForma, for writing the sequence of fully characterized proteoforms. 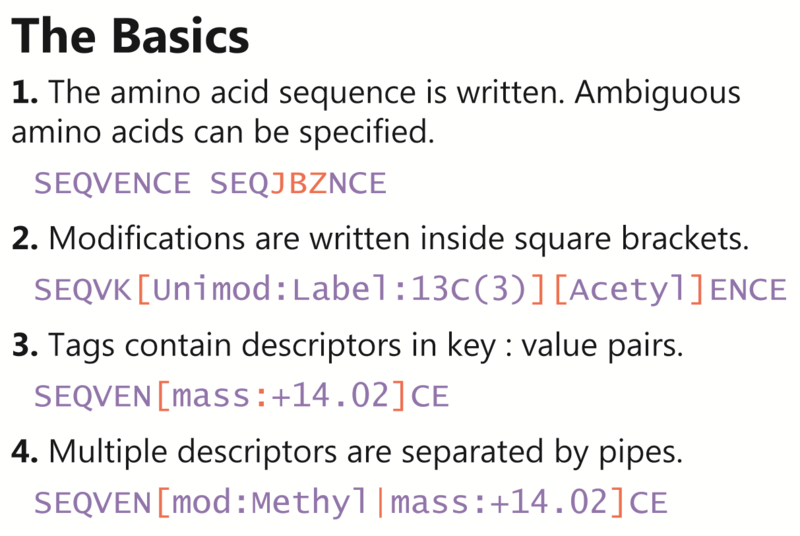 ProForma provides a means to communicate any proteoform by writing the amino acid sequence using standard one-letter notation and specifying modifications or unidentified mass shifts within brackets following certain amino acids. 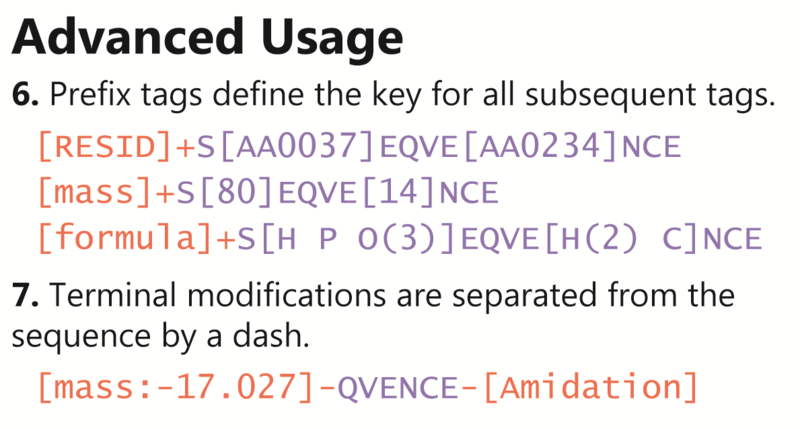 The notation is unambiguous, human readable, and can easily be parsed and written by bioinformatic tools. 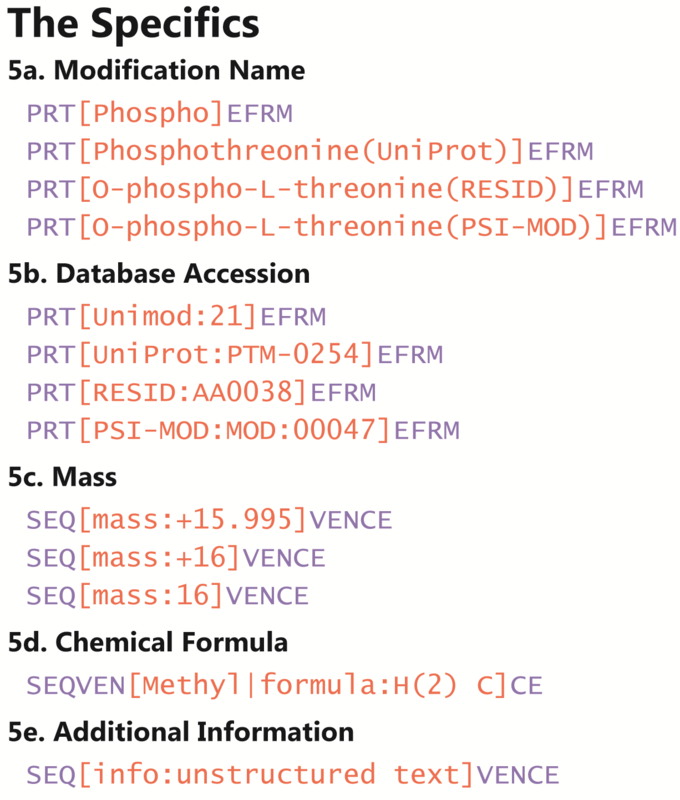 More details are in the publication: ProForma: a Standard Proteoform Notation. Reprinted with permission from ProForma: a Standard Proteoform Notation. Richard D. LeDuc, Veit Schwämmle, Michael R. Shortreed, Anthony J. Cesnik, Stefan K. Solntsev, Jared B. Shaw, Maria J. Martin, Juan A. Vizcaíno, Emanuele Alpi, Paul Danis, Neil L. Kelleher, Lloyd M. Smith, Ying Ge, Jeffrey N. Agar, Julia Chamot-Rooke, Joseph Loo, Ljiljana Paša-Tolić, and Yury O. Tsybin, Journal of Proteome Research, Published online February 5, 2018, DOI: 10.1021/acs.jproteome.7b00851. Copyright 2018 American Chemical Society.